Backpack Full of… Deprivation and Discrimination? While the film is entitled “Backpack Full of Cash” it proves to be an ironic term to describe the deprivation that many students, especially in public institutions, experience when enveloped in a city with a rampant number of charter schools. One of the most important scenes in the film begins at 26:54 in Backpack Full of Cash. A young student enrolled in a Philadelphia public school explained how she needs art and music- “I need to play my violin like peanut butter needs jelly. I need an art like a tree needs leaves” ( Mondale, Backpack Full of Cash 27:02). This scene is key because the film’s audience isable to witness how important music and art programs are for students through a speech by a student herself. It also displays the negative effects of privatizing education because it removes funding for paramount programs from public schools. The filmmakers shot this scene in an intriguing manner. They zoomed in on the young woman speaking. However, they maintain the individuals behind her in the scene. 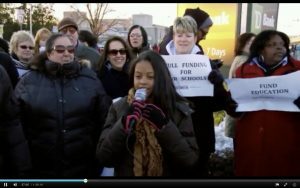 One woman with sunglasses is smiling as the student speaks, and another woman next to her is smiling as well while holding a bolded letter sign that says “FULL FUNDING FOR OUR SCHOOLS.” Therefore, by including the smiling women behind the student, the filmmakers are making the argument that people are enthused, and fully support the movement against lack of funding for public schools. By hearing the student speak, people are able to understand not only how important extra curricular programs are for a well rounded education, but how they are a necessity. There is one hole in the documentary, however. The film mentioned briefly the discrimination against students with disabilities, saying that while they could not legally deny them admission, families would often be told- “You would be better off in a district school” (Mondale, Backpack Full of Cash 20:20). However, the hope occurs with the fact that the audience does not hear any stories from the perspective of students with disabilities. While the stories are represented through other voices, the film is lacking first hand accounts from students with disabilities. This is an aspect of the film I particularly paid attention to since my brother is on the Autism Spectrum. I am an advocate for the representations of voices from all backgrounds, and while I appreciated hearing from concerned faculty and administrators regarding the discrimination against students with disabilities, I would have enjoyed hearing the story of an actual student. Mondale, S. (Director/Producer), & Aronow, V. (Producer). (2016). Backpack full of cash. [DVD]. United States: Stone Lantern Films and Turnstone Productions.